This tropics-inspired winner features frozen pineapple tidbits and frozen mango chunks from Trader Joe’s. Starting with frozen ingredients gives the intense fruit flavor I’m looking for. If I have to add ice to get the smoothie cold that dilutes it. If your grocery doesn’t have frozen pineapple or mango chunks you can make your own. Sometimes I buy pineapple from Costco, cut it up, and freeze it. I freeze the pineapple chunks on a baking tray first, then transfer them to a gallon ziplock bag. That keeps the pineapple chunks from sticking together. This smoothie is on the frozen side, close to a sorbet. In fact, if you want a sorbet, just throw it in the freezer for a while, maybe with an egg white or a smidge of liquor stirred in to keep it from freezing too hard. I have a high-speed Vitamix blender that chews through frozen fruit. If your blender needs coaxing or you don’t like your smoothie quite as cold as I do, microwave the fruit for a few seconds to soften it before blending. You may also need to stop your blender periodically to push the fruit down the sides. Use your choice of dairy, soy, almond, or other milk for this smoothie: I used unsweetened soy milk and a spoonful of Thai Kitchen Coconut Milk. You could try adding a little more milk if your blender needs a higher proportion of liquid. 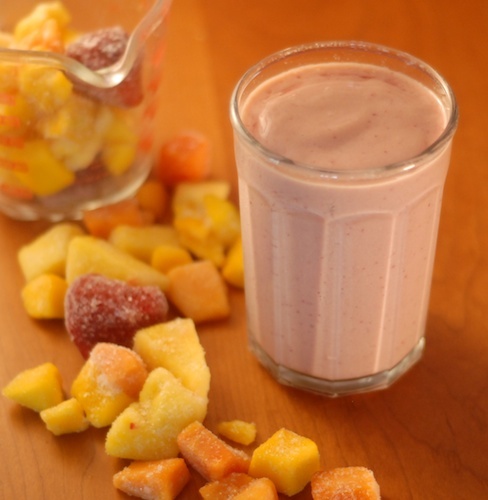 A tropics-inspired smoothie from frozen mango and pineapple pieces, unsweetened milk (soy, almond, or other) and coconut. Combine all ingredients in Vitamix or other powerful blender, process starting on low speed and gradually increasing speed to high. Nutritional information: Calories: 378, Fat: 6.5 g, Sat. Fat. 2.2 g., Protein 9.2 g., Sodium 92.5 mg, Carb. 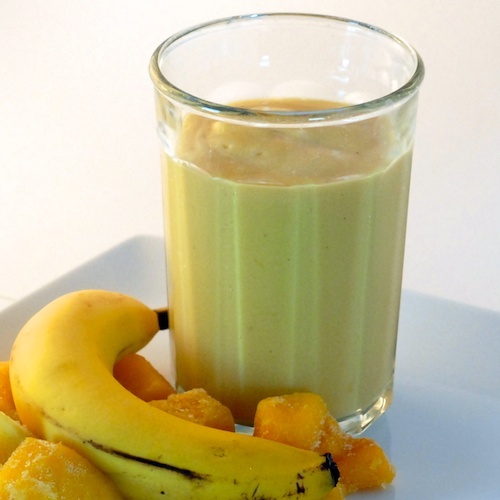 70.8 g., Fiber 7.5 g., Sugar 45.0 g., Calcium 330 mg.
Banana Mango Smoothie This banana mango smoothie balances sweet banana perfectly with tart mango. Done in five minutes using three ingredients. 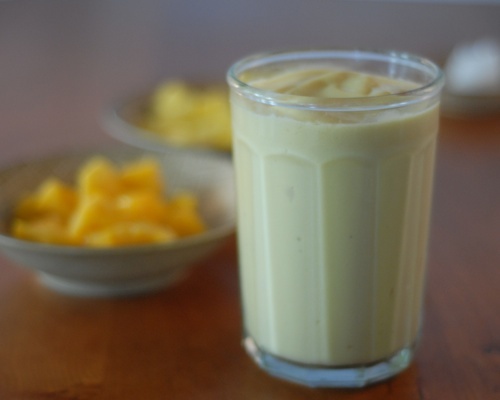 frozen mango chunks, one medium-ripe banana, and unsweetened almond or soy milk. 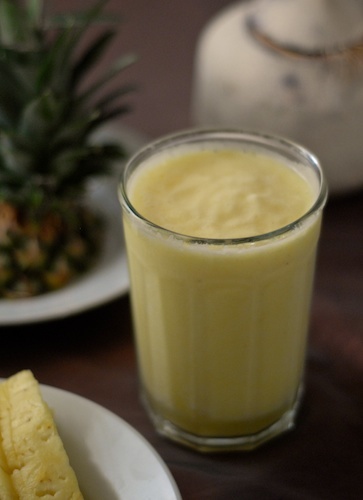 Pineapple Young Coconut Smoothie Fresh, tropical, and way lighter than a pina colada, this pineapple coconut water smoothie has lots of potassium and is perfect for recharging after a workout. Try it in its simplest, lightest version or add a little coconut milk or young coconut meat for added creaminess. Festival Blend Smoothie A quick mix of mango, papaya, pineapple, and strawberry, plus soy (or other) milk. 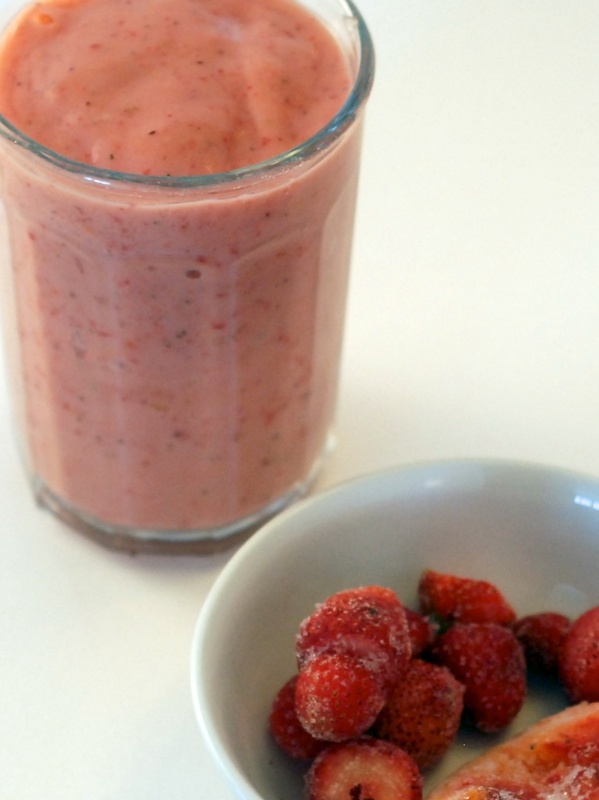 Strawberry Peach Smoothie with Cider You can really taste the peach flavor in this smoothie recipe, made with a frozen peach, a handful of strawberries, non-dairy milk, and apple cider.